This miniload system offers extraordinary versatility, and can be integrated into any production or storage system. 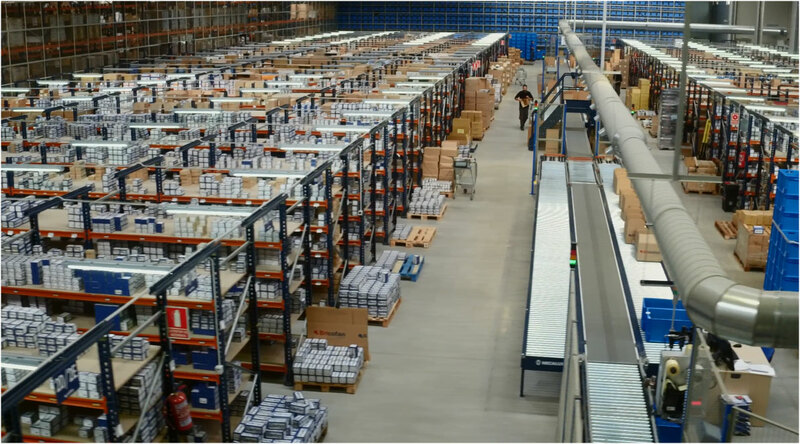 Automated warehouse system for boxes which includes the racking, machinery and management software in a single product. Easily expandable system which can be quickly dismantled and reassembled. Increases safety by reducing operator fatigue. Stacker cranes maximize capacity and increase throughput while operating smoothly and quietly. Whether selecting the automated warehouse IN-A-BOX or fully customizing a product for specific storage needs, the Interlake Mecalux Mini Load AS/RS has the versatility and functionality desired in an automated warehouse. With three operating modes, fully automated, semi-automated, or manual, and a warehouse management software designed to be user-friendly, training on the system is simple. Although plastic boxes (totes) are used most often, the system is compatible with metal containers, plastic trays, collapsible totes or cardboard cases/boxes.